The LSA annunciator system is a family of devices which can be wall-mounted or installed in a switching cabinet for processing simple group- or new value alerts. Master modules can be extended through the addition of group modules. The LSA 08-511 common alarm indicator can process up to 8 signal inputs. Each additional group module increases the number of inputs by eight each time. 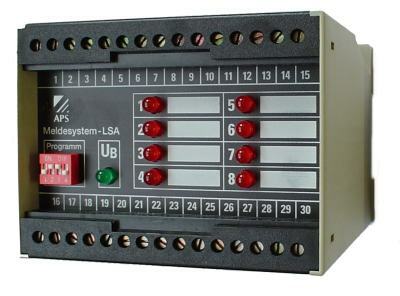 The LSA 08-311 annunciator system for new-/first-up values can handle up to 8 signal inputs. Each additional group module increases the number of inputs by eight each time.